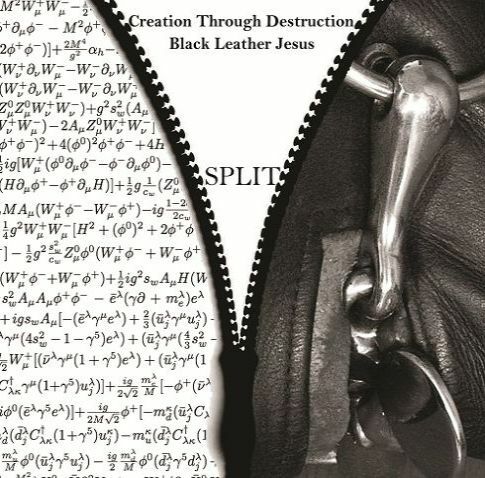 Here’s a longish split from two harsh noise projects – one is the very well-known group Black Leather Jesus with its revolving door of players, and the other is Creation Through Destruction, a harsh noise moniker of Dr. Alex from Dead Body Collection. There are four tracks on this split, two nearly 20 minute pieces from both parties, for a huge smattering of not-quite harsh noise wall soundscapes. First up are the two tracks from Creation Through Destruction. These are highly fluctuating pieces; both “Uncertainty Principle” and “Stellar Magnetic Field” are all over the gamut of harsh noise, from whooshes of static and huge bass-driven vignettes with lots of static, some feedback, and other searing qualities. These are fun to listen to in the moment because they are so different from the principles of harsh noise wall; the sounds could be contained within a wall, but they move throughout different places on each recording so much that they become more like efforts to contain sounds that are bursting forth. The problem, however, is that Creation Through Destruction tends to shift so much that neither track becomes a memorable experience. I wouldn’t be able to pick one from the other because, by the time the 15 minutes of each track are up, I’ve forgotten where it began and where the artist has taken us. Too much variety can do that, and it’s interesting that this plagues Dr. Alex in Creation Through Destruction because his other work in Dead Body Collection is so immobile. The Black Leather Jesus side is what you might expect from the group. There’s a huge mass of sound on “Stall Exhibitionists” using static and bass, and while this maintains its rigidity, small tendrils of sound escape the clutches – beeps and glitches, some light feedback manipulations – that hold the whole track together as a whole. “Bearfighter” works much the same way, where the collective establishes a baseline – this time crunchy static that judders and flits around rhythmically – while the remaining electronics focus on the underlying textures to give more detail to a heavily-structured wall. This is a technique Black Leather Jesus does well, and while these tracks aren’t surprising, they are still great to listen to. This split is a fine album, though it’s not as good as the two artists’ pedigrees might indicate. Creation Through Destruction’s side left me less than enamored while the BLJ side is classic but unevolving. The collaboration here also feels strange; the two are tackling separate and inequivalent ideas on this split, and it’s probably not the best use of either of their material.